Websites don’t just magically show up and rank on Googles first page. The majority of websites that do rank are there for good reason, and you can bet that a driving factor for those rankings revert back to some form of link building. If you’re seeking high rankings and more traffic to your business in this day and age, you must focus on implementing link building strategies for your website. The more quality backlinks you have pointing toward your website, the more credible and authoritative you appear, not only to readers, but to the very engines that bring those readers to your website. The process of earning these links is known as link building. We’re going to cover the latest and greatest resources and techniques for link building today. Want to embed this bad boy? What is Link Building & Why Does it Matter? Aside from bringing traffic to your website or blog, backlinks also play a role in how Google ranks your website. Among the major ranking factors, backlinks play a significant role in helping Google understand how others view your site. Starting in the late 1990s, search engine algorithms have looked at backlinks as a vote of confidence from one site to another. Google’s algorithm has an incredibly detailed way of looking at links and judging their quality. A search engine looks at this tag and sees a road sign pointing it to another site. The href tag signals a link, and after the link, before the closing tag is known as the “anchor text” is what users see on the page itself. It’s usually blue and underlined to showcase that it can be clicked and followed. Backlinks first found their importance in the late 1990s when one of Google’s founders created something called PageRank. 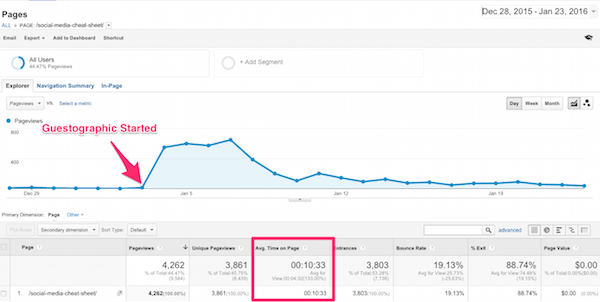 Originally, this metric was designed to rank sites based on how many backlinks they had from other sites. Black hat SEO specialists quickly found ways to manipulate this metric, which resulted in Google cracking down on how they judge backlinks with the Penguin updates. These days, search engines not only look at the number of links pointing to your site, but more so the quality and relevance of the sites that have linked to you. This is used in conjunction with your content and other factors to decide how your page should rank. The goal of link building is to use proven techniques that will earn you backlinks from high-quality websites. It sounds simple, but it requires a large investment of time and effort if you don’t know what you’re doing. What Does Building Links do For Me? Earning high-quality links will help increase your search engine rankings, which results in more organic traffic to your site. These new visitors will be interested in your content and the value proposition you’re offering them. Ultimately, this new traffic will bring you more conversions and, therefore, more sales and returns on your hard work. Next we’ll look at the ranking factors that are directly tied to backlinks. This will help you see how your building efforts are contributing to your overall rank. There are many different ranking factors that Google’s algorithm uses to evaluate each and every website hosted on the internet. Today I’m going to share with you the ones that specifically attribute to link building efforts. It’s important to understand these factors because they give you insight into how you should structure your link building strategy. Knowing how and why certain links work helps you understand the “hows” and the “whys” behind choosing which backlinks to pursue. #1 Domain Age – Older domains will generally have more authority and thus more value. Backlinks you receive from domains older than 10 years can carry more weight or “link juice.” Additionally, if you have an aged domain you can have advantage over newer domains in their infancy. #2 The Number of Referring Domains – To this day, the number of different domains linking to your site is one of the major ranking factors. In short, the more websites linking to you, the more authority you’ll have. #3 Links From Different C-Class IPs – Earning links from different IP addresses showcases a wider and more natural profile. Backlinks from the same C Class IP can raise red flags. IPs are split into lettered sections, like so: AAA.BBB.CCC.DDD. Having too many links from the same IP is one-way black hatter’s used to and still try to manipulate links and rankings. #4 Total Number of Linking Pages – This is the full count of your backlinks (even ones from the domain). This number is also taken into account. #5 Alt Text For Images – The alt text you use when uploading images is important because it acts as the anchor text for any backlinks that point to your image. #6 Backlinks From .gov or .edu Domains – Reason why? More likely than not a domain with the extension .gov or .edu is a government organization or an educational institution. Both of which will have a lot of authority and therefore a lot of value. #7 The Linking Page’s Authority – As previously mentioned, the authority of the pages that link to you is an important factor as well. This is measured by Moz’s Page Authority score. #8 The Linking Domain’s Authority – On a more broad scope, the authority of the overall domain also plays a factor. This is also measured by Moz using their Domain Authority score. #9 Links From Your Competition – Not always the easiest thing to attain but earning links from other sites ranking for the same keywords can give your page an edge over the competition. #10 Author Byline Guest Posts –When you write guest posts for other websites, they will generally give you a boxed description at the bottom of the article for a brief biography of you with a link back to your website. Be careful, using these links alone can be a slippery slope. Links within the content are better (see #14). #11 Links From a Domain’s Homepage – If the Backlink comes from a domain’s homepage, it will carry more value than a link from a deeper internal page. #12 The Value of Nofollow Links – While you’ll find plenty of people on both sides of the fence here, nofollow links can help balance out your profile and make it look more natural than spammy. Besides, they still bring you referral traffic which is just as important, if not more! #13 Diversity of Links – You’ll want your backlinks to come from multiple types of sources like guest posts, editorial, organic mentions, resources, etc. Too many from one source can result in raising red flags. #14 Links Within Content – You’ll find that backlinks given to you within the context of a web page are more valuable than one that is placed in a blank space or in a unnatural location. These are also called “contextual links”. #15 Anchor Text in Your Backlinks – The anchor text provides a description of the backlink. Using a relevant and keyword focused term (with variety) can add relevance to the link’s importance. #16 Link Location – The location of where your backlink is on the referring page’s content also matters. In short, links in the beginning are more valuable than those near the end. #17 Reciprocal Links – Refers to a “link exchange” between your website and another where they link to you and you link to them. Too many of these can raise red flags that you’re simply telling other websites “hey if I link to you, will you link to me?” Don’t do that. #18 Relevancy of Links – Any smart link strategy will seek out relevant links. You want your links coming from sites in your niche, not from someplace completely unrelated. A backlink should be relevant in order to benefit the readers and search engines who follow it to your site. #19 Overall Page Relevance – In addition to the point above, the Hilltop Algorithm states that a referring page’s content should also be relevant to the content on the page they are linking to on your site. #20 Keywords in The Page’s Title – A link that comes from a page using similar keywords in their title as your page is important. Google calls this “Experts linking to Experts.” It shows that they are linking to you because you have addition information on that page relevant to the subject at hand. #21 Positive Velocity – While it’s hard to define the ideal link velocity, this metric refers to the rate at which your site is receiving new backlinks. You want activity, but not so much that it looks like you’re trying to spam the system. Maintaining this metric will give you a SERP boost for sure. #22 “Hub” Page Links – Earning links from pages that are structured as a resource (i.e “Hub) are more valuable that others. #23 Number of Outbound Links on the Page – The more links on the page, the more links Google has to follow and take into account. Believe it or not, even Google’s technology has it’s limitations and the further your link is from the top, the less likely it will even be seen. #24 Co-Occurrence – This term refers to the text surrounding your backlink’s anchor text. It’s nothing new, but it has been a major focus recently. 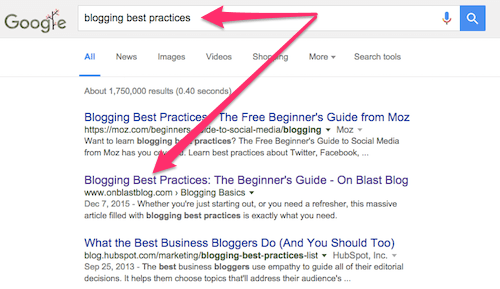 For backlinks, the words surrounding it will help provide context for Google to use. #25 Link Age – The older your links are, the more value they contribute to your ranking. #26 TrustRank of The Referring Domain – The level of TrustRank a referring site has will directly affect the quality of their backlinks to you. This metric measures the reliability of a site (a low rank indicates spam). Considering these factors will help you structure your approach to choosing which sites to target and which ones to avoid. Next we’re going to look at the best strategies for link building in 2019. As time goes on, SEO changes and evolves. What worked five years ago for building links may not have the same effect today. In the world of SEO, that’s an eternity. Coming up, we’re looking at up-to-date link building strategies that work in 2019. The ever-popular “Skyscraper Technique” is designed to help you create a structure that produces high quality content people want to link to. The nice thing about this strategy is the simplicity. It sounds simple, and it truly is. To accomplish the first step, you should use a keyword tool of your choice to find potential target phrases. (Try Google Keyword Planner or the Google Keyword Planner Alternative). You’ll want to start by choosing keywords with a search volume above 1,000 on average a month. The more the better but be careful of broad keywords. 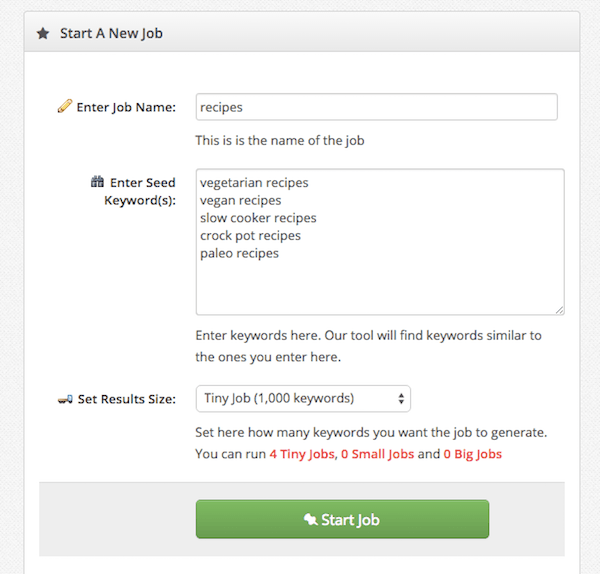 Once you’ve selected a few keywords, plug them into Moz’s Keyword Difficulty Tool. 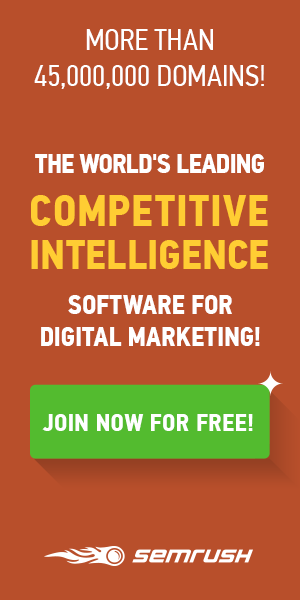 This tool will determine how difficult it really is to rank for a particular keyword. Anything above 50% will take you quite some time to rank for unless you’re already an established website. Anything below 50% should be your 1-year goal. Any keywords with a difficulty score between 1-30 should be relatively easy to rank for using this approach. Once you’ve found your target keyword, you will then look at the top performing articles/pages for that keyword. Do a Google search for the keyword. 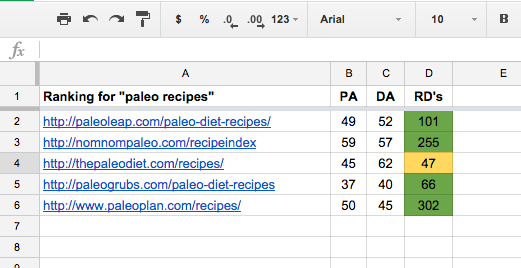 List out a few websites ranking for the keyword and put them into a spreadsheet using Google docs. Run each of these websites in your favorite backlink tool (One of my favorites is Ahrefs). 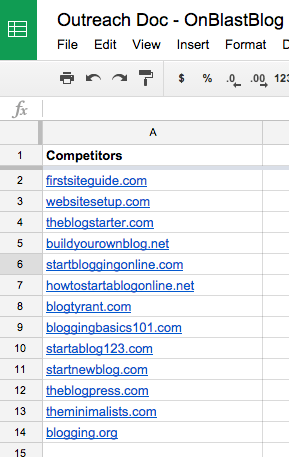 If a competitive article has more than 30 referring domains pointing to it, keep it on your spreadsheet. Less than 30 referring domains? Save those for later. Next step is to analyze these pages that are ranking. Dig deep and steep into the mind of someone who was searching for this piece of content. Ask yourself, how long is it? How many images are they using? What keywords and phrases are being used? How can this be improved? These competitive articles will help show what the audience is looking for in regards to this specific topic. 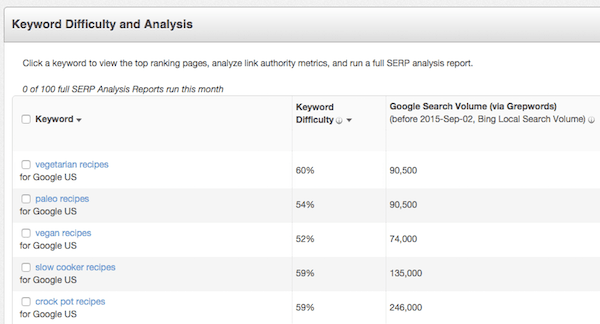 PRO TIP: You can use a tool like SEMrush to see exactly what keywords these pages are ranking for as well. When you’re writing your own version of this topic, strive to make it longer, more in-depth, and better optimized than your competition. The final step involves promoting your content by reaching out to all of the websites that link to your competitors original article (the one that you made longer and better). Ask them to link to your new post if they like it and watch as the backlinks come rushing in. You can expect a conversion rate between 1% – 15%. If you like the sound of this strategy, be sure to check out my full case study on the “Skyscraper Technique” later in this post for insight on exactly what to email these potential linkers. Wow, that must have been incredibly hard/expensive to make! Honestly, it wasn’t too difficult. You can either plan it out and hire a designer on Upwork or People Per Hour, or you can simply use a designing tool like Visme, Canva or Infogram to do it yourself! Plan and create a useful and visually appealing infographic (by doing research on which infographics have worked for your competitors). Use Visual.ly to sort by most favorited infographics to see what’s already gone viral. You can place their infographic URL into tools like Majestic to see how many backlinks it has, or Buzzsumo to see how many social shares it has received). Once you’ve decided which topic you plan to use for your infographic, you can use Google’s index to search for your main topics keywords (and variations of it) and begin to collect a list of all the websites that rank for those terms.You can even scrape the results on Google and export to a csv.Download the Moz SEO Toolbar Chrome extension. These sites have already written articles about your infographic topic and will be more inclined to reading and linking to your design. Once you have a list of websites that rank for your main topics keywords, you can utilize a pitch like below to begin outreach in order to obtain links to your infographic. [How and Why you found the website you’re contacting] and I came across [Website Title]. I’m a big fan of some of your work, especially [Mention Articles or point the author made]. I actually just finished the final touches on an infographic [Describe your infographic and why it’s different]. Let me know if you want to check it out. I’d love to send it your way. Once the website gets back to you and says that they’d like to check out your infographic, your next response needs to provide value in it in order to secure your website a link. Utilize the response pitch below to increase your likelihood of capturing the link opportunity! Please let me know if you’d like to use it. If so, I would be more than happy to write a unique intro to pair alongside the infographic. Boom! This is the one of most effective ways to build links for your infographics. You can expect conversion rates anywhere between 1%-20%. Create something tailored to your audience. Make it obvious who it’s for. Don’t over-complicate things. These are designed to take something complicated and boil it down to an easily digestible form. Stay focused on your topic and streamline the design so it’s easy to read. Strike a balance between visuals and written content. Strive to say things with visuals instead of words for the best effect. Make sure the smallest font present on your image is still readable after resizing. Limit the length to somewhere in the ballpark of 8,000 pixels. Too much longer and you’ll lose the attention of the reader. Include white space so the infographic is easy to read and skim through. Rock an awesome and eye-catching headline. Cite your sources at the end and double check all of your statistics and claims. Believe it or not, there are blogs out there that publish posts solely for the purpose of linking to awesome content around the internet. These fountains of awesomeness are known as link roundups. More than likely there are several of these in your niche, but you’ll need to find them first. Anything along those lines should bring up the kind of targets you’re looking for. Once you’ve found them, you’ll need to send a rock-solid pitch to showcase your content/resource and why it deserves to be on these lists. I’ve been following your roundups for quite some time and I finally have something I think is worthy. I have an active social following and I’d love to promote the post through my social avenues if you decide to use it. Something important to remember, is that link roundups are looking for fresh and new content. Don’t pitch them something you published a month ago. 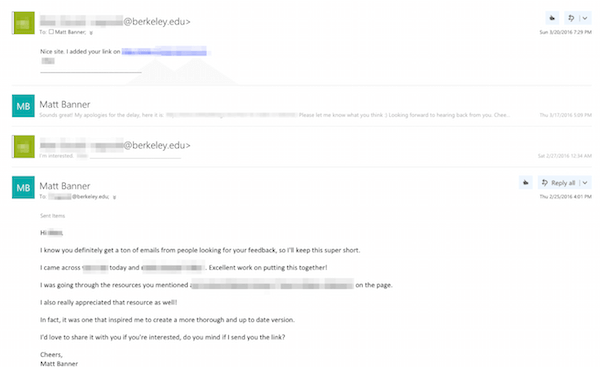 Send out this type of pitch shortly after you’ve published your article resource for best results (usually within a few days after it goes up). Next thing you know, you’ll have a handful of backlinks from these resource hubs. Stop rolling your eyes! I know guest posting can be a horrific task, mostly because finding lucrative opportunities is like trying to find a needle in one of a hundred haystacks while blindfolded and with your hands tied behind your back. While it can be difficult to find solid guest post opportunities, I’m going to show you an easier way to find them, but first let’s break this strategy down. Receive a backlink when the post goes live and bring readers from their blog to yours. Make sure you review each blog’s guidelines carefully. Some blogs will give you a no-follow backlink, which isn’t the end of the world, but it may not be what you want at that point in your link building strategy. My name is [Name], I’m a blogger specializing in [Your Industry/Profession]. I noticed that you accept guest posts, are you still accepting them? If you are, I’d love to submit content for your reviewal. Below are a few links to my most recent guest posts. Now, back to the part about finding opportunities. Outside of the obvious use of Google here, One of best and most overlooked places to find blogs that are posting guest topics in your niche is Twitter. Twitter is a widely used social media platform and many sites announce guest posts on their Twitter accounts. 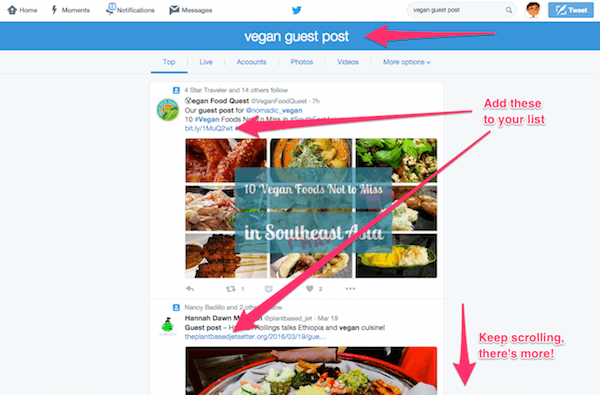 It’s also really easy to see how quickly and often blogs are tweeting about guest posts. If you see one doing it a lot, then you know they’re in the business of accepting and publishing posts. Start by heading over to the Twitter search page. Here you can plug in some terms that will bring up the kinds of tweets you’re looking for. For each of these, search for your niche, plus the term given below (the same goes for utilizing Google). Read the guidelines until your eyes are about to fall out, then read them again. The fine print is always important to understand so that you don’t make avoidable mistakes. 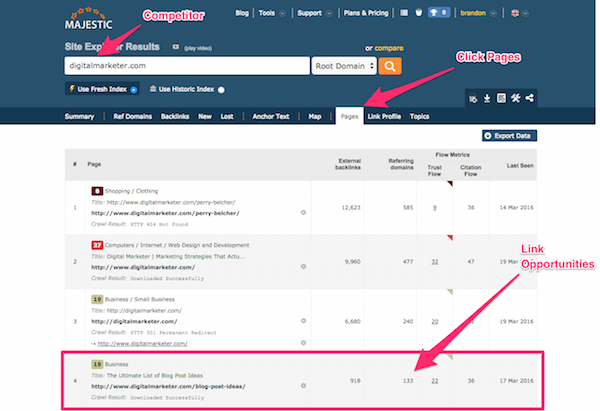 For this strategy, you’ll want to use a tool like Majestic to analyze your competitors and find resource pages that are providing backlinks to other sites in your niche. These pages exist for certain niches and on educational (.edu) websites as well. Seek out resource pages using Majestic and by using search strings on Google. Specifically, we’re looking for pages filled with links to resources in your niche. 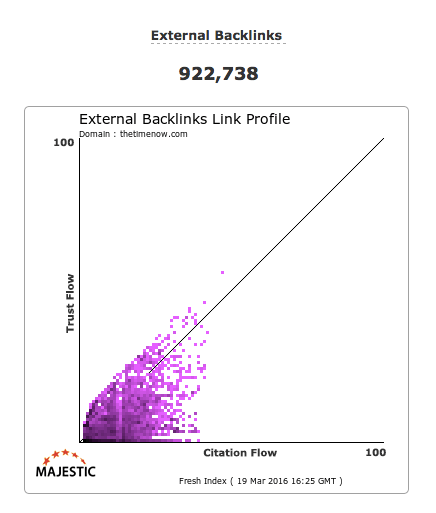 Majestic will analyze your competitor’s backlinks and provide you with a list of sites already linking to them. 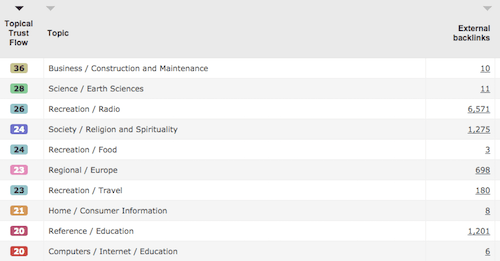 You can then easily go through the list (or use CTRL + F to search for “resource” terms). In addition, universities and college websites have resource pages of their own that offer links to helpful sites that professors and students can use. Receiving backlinks from sites like these (.edu) are extremely powerful. My name is [Name] from [Your Website]. I wanted to start off by saying that I think [Site Name] is incredible, I love [Something you enjoy about the website you’re contacting]. I recently came across your [Name of Resources Page – hyperlinked to URL of resources] and would love if you could consider adding my [Name of your Resource Page – hyperlinked to your URL] to your page. I strongly feel like my resource would be beneficial to your visitors and readers. As you can probably tell, this approach is VERY aggressive. I’ve had this approach work for me plenty of times, but keep in mind that some website owners won’t like this direct approach. Feel free to tweak the wording as you see fit, but remember that being confident in your approach can be a great way to get the ball rolling. This strategy is something powerful and effective you can do that is a perfectly white-hat method of building links. 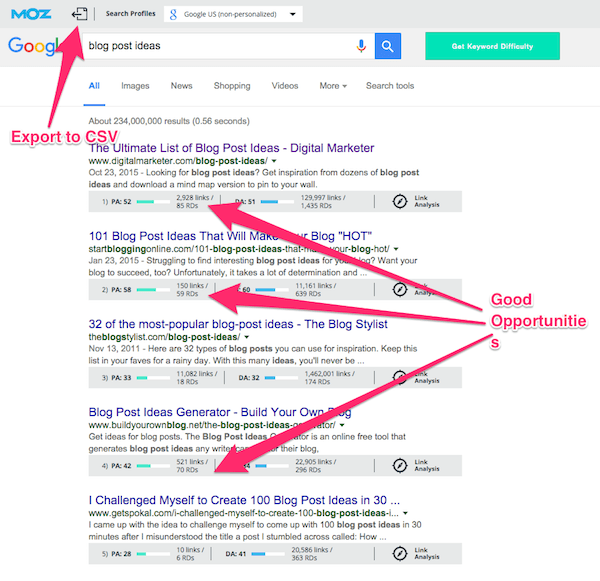 While I’m going to cover the strategy here, you can find an incredibly in-depth guide on broken link building on Moz. The concept of this strategy is finding links that are hitting a 404 error and making the site owner aware of them. Doing this favor allows you to not only help them out, but suggest a better link to replace it with, namely your own. Notify the website’s owner and suggest your own links as a solution. To find resource pages, simply type your niche into Google and combine it with terms like “resource page”, “links” and “resources”. Once you’ve found some, try using a browser extension like Link Miner from Point Blank SEO. This will quickly and easily show you links highlighted in red that are hitting a 404 error. On another note, I have a website [Your Site], that [What you do, Why your unique] that I think would fit perfectly in your list of resources. At this point, not only have you done them a favor, but you’ve also pitched your site to them in the process. It’s a win-win for everyone involved. Businesses are all about testimonials from their customers. These are an incredible way to turn leads into conversions, so often they won’t say no to those who offer. This is where you come in. Consider the products/services you’ve purchased for your blog, which ones did you love? Write up testimonials for these products and send them over. To make the testimonial valid, the company will include a link back to your site when they post it. Boom! The Moving Man Method is yet another of Brian Dean’s incredible backlink strategies. This approach to building links is composed of three simple steps. Find web pages or resource pages that changed their name, moved to a new URL, were shut down or have stopped updating completely. Let the site’s owner know that they have an outdated link on their site. You can find these types of links pretty easily by searching for companies that have rebranded, changed their services or shut down. 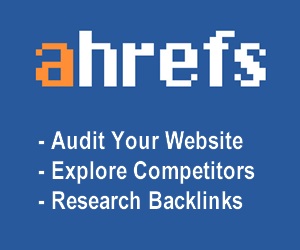 Once you’ve found them, a tool like Ahrefs can be used to see which sites are still pointing to this outdated source. Much like the Broken Link method, when you notify these site owners of their outdated link, you’re doing them a huge favor. At the same time, you can gently suggest that put a link to your site in their resource list. Most site owners are more than happy to give you a backlink in return for helping them out. I’m sure at one point this was called the “I’ll scratch your back and you scratch mine method” but the current title is shorter. Earning backlinks without any effort requires your site to be organized in such a way that finding your great content is easy for people and search engines. While it’s extremely important to link to your external sources and resources, you must also remember to create a solid profile of internal links. Internal links make it easy for readers and spiders that crawl your site to find the deeper pages and posts. It can’t be forced, though, it has to be natural. Use anchor text that makes it easy for the reader to know where they’re going. Balance your external links with internal ones for maximum effect, organization, and optimization. Internal links create a solid foundation for your blog’s SEO, which makes it easier to discover and link to your content. This strategy is so huge, so awesome, so utterly beneficial to your link building that it has to have its own section. The goal here is to create a method by which you reach hundreds of sites that you want backlinks from and to pitch them your content. What Does Email Outreach Do For Me? Having an email outreach plan in place not only gives you the means to reach hundreds of website owners, but it also fits into many of the previously mentioned strategies. Even if you’re simply reaching out to similar sites Showcasing your new content/resource this strategy will help you organize and focus your efforts. I’m going to break it down into simple and easy steps for you, right here, right now. 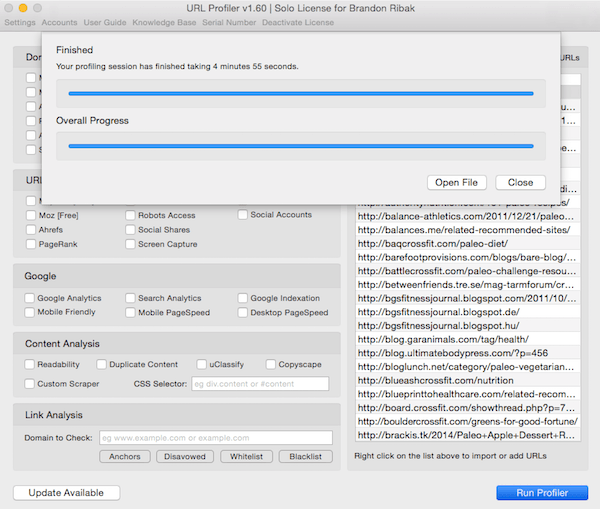 For the first step, I use a tool called URL Profiler. While it does cost about $30/month, it’s absolutely worth it for the sheer amount of information it provides. Let’s say you found two-hundred URLs that had broken or outdated links and you want to contact them. Instead of manually researching each one, you can instead retrieve all of the information you want and need instantly with this tool. This data will feed you all the information you need on emails and contact forms. In some cases, the emails will be dead or outdated. 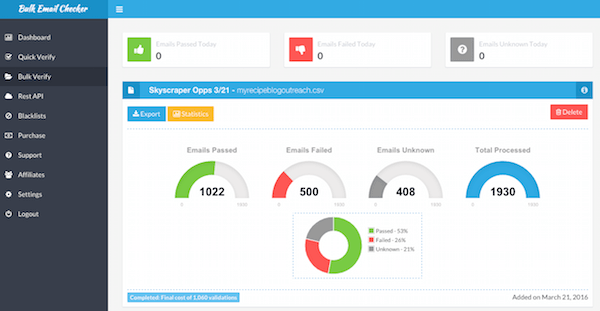 To ensure you’re not wasting time sending emails that won’t go through, use Bulk Email Checker. 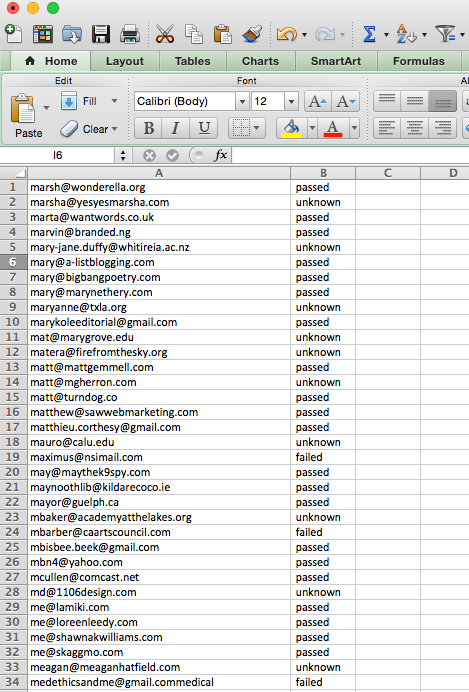 I take all of the emails I received from URL Profiler and I plug them into this handy tool. It then tests them with over 17 factors to ensure they are real and legitimate emails. What’s awesome too is it only costs $9.95 for 10,000 emails! The price is perfect for the time and energy I’m saving. The emails will come back as passed, failed, or unknown. I can immediately cut out the dead ones. The unknown options are a coin toss, so I typically pursue a contact page for these URLs just to be sure. When it comes time to start sending your emails, you have two options. You can go the route of a CRM which automatically sends the emails in huge chunks, or you can do it manually. As you can see, the only real downsides with using a CRM are the potential to get blacklisted or flagged as spam because you’re moving so many emails so quickly. The other option is to do it manually. You can still send large amounts of emails in Gmail, Outlook, etc. The real downside here is the time commitment. Either method works, but keep in mind the time commitment and prepare accordingly if you decide to go the manual route. When you’re structuring these emails, depending on the type of outreach, you should also include an option to unsubscribe. This way you’re not spending time and effort on a dead end if someone’s not interested. Now, I’m sure you’re excited to start, but first we need to make sure you don’t accidentally incur any penalties from Google. This will hamper your efforts and slow you down. Google issues penalties for breaking the rules. This doesn’t just apply to backlinks either. You can receive a penalty from Google for a number of SEO no-no’s. Keep in mind as we look at ways to avoid backlink penalties, that I’m not accusing you of doing these things, but just in case someone suggests them to you, or you do it without realizing, you’ll know that it needs to be fixed or avoided altogether. In addition, be sure to avoid getting backlinks from sites that are using these methods. You don’t want to be guilty by association. This term applies to sites that exist for the sole purpose of increasing their Page Authority artificially. You’ll know these when they require a link to be exchanged for the one you’re getting. The issue here, beyond the requirement, is that these links are usually unrelated and therefore useless to Google and its users. By that logic, it gets the boot. This tactic involves placing links or keywords on a page in incredibly small font and colored the same shade as the background. What’s the purpose? Well, Google will index this content, but readers won’t see it. This is plain sneaky, and anything that earns that adjective should be avoided. This one is easy to do without realizing. Generally, guest post links should only make up about 20% of your overall backlink profile. Beyond an unbalance in your profile, too many guest posts can result in you receiving too many links from a single source, which is also a bad idea. In many cases, guest post guidelines state that your site’s link is in the bio, but you can actually earn a lot more link juice by placing a link to your site within the content itself. It doesn’t need to be the home page either, try linking to something related on your site for maximum results. How Do I Know if I’ve Been Penalized? There are a number of signs that you’ve brought on the ire of Google. Look for these warnings. The number of backlinks pointing to your site doesn’t matter in the slightest if they aren’t relevant to your readers. Google is far more interest in you building links that make sense given your site’s topic and niche. The anchor text you have for your backlinks and your internal links needs to contribute towards a natural link profile. You want a nice mix of branded anchor text and contextual links. If the majority of your anchor text profile consists of keyword-rich anchors, you’re abusing the system and will likely be caught red handed. The tool I mentioned earlier known as Majestic can help you in this regard. Using its Trust Flow feature, you can see how your site is viewed in the eyes of others based on your backlinks. Why is this important? Well, trust is combined with relevance and authority to help determine your rank. Look for backlinks from sites that already have a lot of the aforementioned domains pointing to them. Look for sites with strong brand power and focus your efforts there as well. Out of all these strategies, the one that jumped out at me the most was the Skyscraper Technique posted by Brian Dean. I’m competitive, so the idea of one-upping the competition was too tantalizing to pass on. So, I decided to put my own spin on it and find out if it really worked. Here’s how I did it, and what I accomplished in the end. The first thing I did was look at every website in my niche. I did this by looking at top competitors on pages 1-3 of Google, and then I went deeper by looking at the sites on pages 3-10. I left no stone unturned. I didn’t stop there either. I also looked at sites in my entire “blogging” industry as well. This ensured that the scope of my research wasn’t limited to just the niche. I took those websites and put them into Majestic and Ahrefs. For each domain, I looked at the top pages/posts that had the most links pointing toward them. Looking at those top performing posts, I went to work on writing my own creative take on the topic, while also making the posts longer, more in-depth and authoritative. 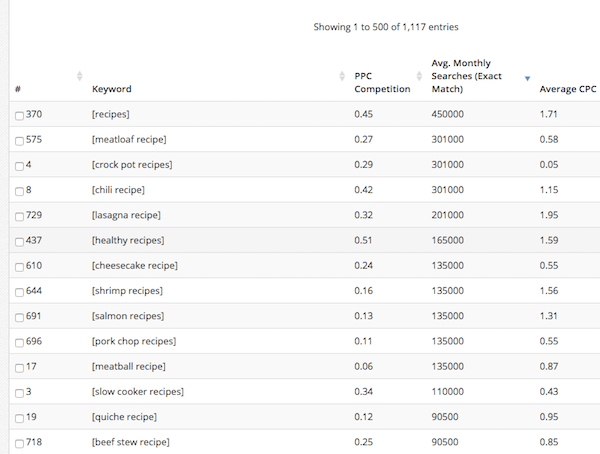 Then I grabbed the main keywords each of the top performing competitive posts ranked for. Compile your list of keywords and head into step two. 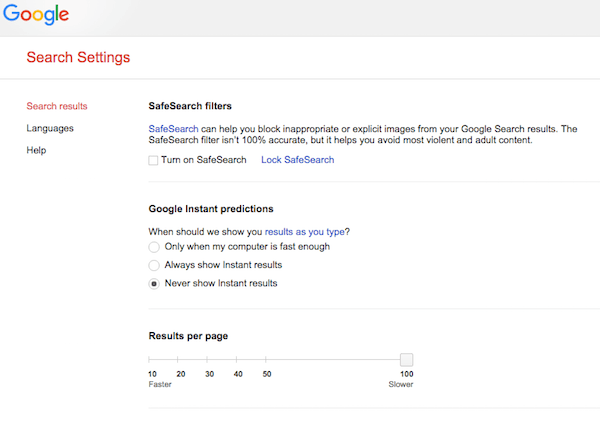 For starters I changed the Google search result settings from 10 results to 100 (you can change the setting from google.com, click the “search settings” option on the lower right corner). Then I started plugging in the keywords I got from step one. I enabled the Moz Toolbar so I could see the Domain Authority and # of backlinks/referring domains for each post. 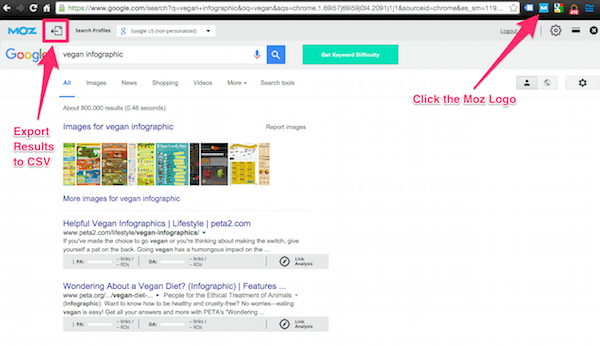 This unique combination gave me the ability to scroll down the SERPs and find out if a keyword was getting a lot of attention and backlinks from top dogs. 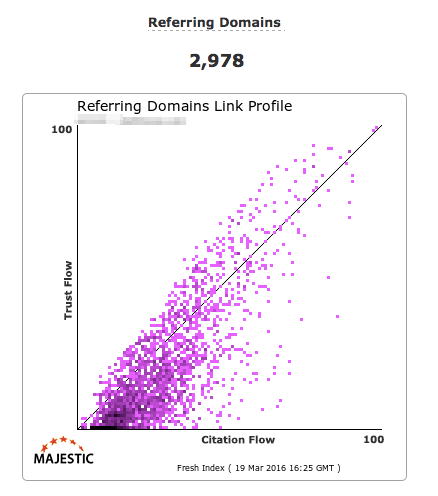 If a particular article had more than 30 referring domains, I took that URL and put it back into Majestic. In the Backlinks section I saw all the domains pointing to that page and downloaded them into a CSV file/spreadsheet. I looked at the links in the spreadsheet and removed any with low trust/citation flow, long permalinks, different languages, site aggregators, and so on. This left me with solid backlinks that I placed under the URL in a spreadsheet. I repeated this process with all the major competitors that both ranked for the keyword variations and had 30 or more referring domains. Now I had all the places I wanted to pitch my new and improved content to for the final stage of the technique. Create a master list of the top domains you want to pitch your content to. At this point, I had a lot of opportunities, but I needed contact information. I used URL Profiler to scrape the information from each of the domains on my list. From there, I sent the information to my virtual assistants who then started compiling and organizing the email contact information for each site. Once I had a list of emails, I placed them into the Bulk Email Checker which then produced a list of emails that were valid and not valid. The final portion was putting together the pitch and sending it out to all of the final emails. 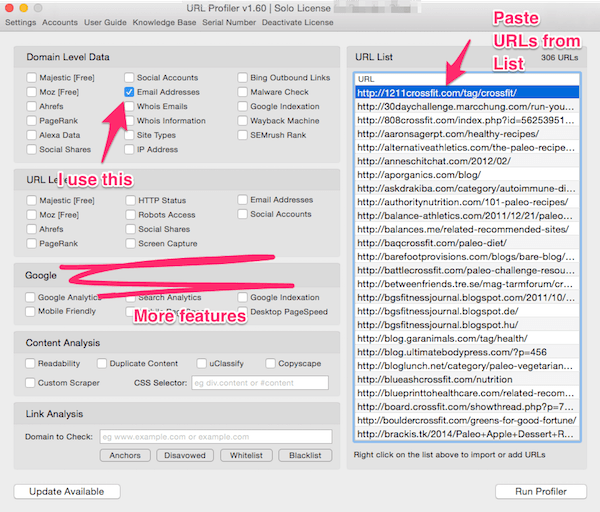 Utilize URL profiler and assistants to acquire email contacts for everyone on your list. Use Bulk Email Checker to find out which emails are valid. Put together your pitch and send it out. PRO TIP: You could probably argue that this is more of an “essential” tip rather than a pro tip, but sending out timely and appropriate follow-up emails is quintessential of a successful link outreach campaign. More than half of the links currently pointing to On Blast Blog are a result of a timely follow-up email. Be careful though, sending too many follow-ups or mistakenly sending a follow up to someone who either got back to you/isn’t interested is a dangerous path to walk. To this day, link building is an amazing way to increase your rankings and strengthen your site. In 2019, these specific strategies are working like a charm. How do you build up your backlink profile? What strategies work for you? Talk to me & Let me know in the comments below! This is awesome. Very useful for anyone looking to learn white hat link building. Thanks for sharing these tips, Matt! Great article read in one breath. I add you to the list of my favorite editors. Thanks and best regards! Thanks for the compliment. Looking forward to seeing you back soon. This is one of the brilliant posts on link building, I read in the recent time. Nothing is untouched here, and if someone follows these techniques and can execute these properly, then this post is going to be tremendous helpful. I am into this industry since a long time but still many things I can ideate from here. Many of these are really hard to implement and execute, but still those are highly effective. Really informative post and loved reading it. Thanks for sharing this. Thanks Soumya, i’m glad to help! This is an incredible post, Matt! So much great information on this site! Thanks so much for all you share here and the level of detail on strategies! Great article, I like that you included examples of how it worked for you. Bookmarked to reference later as I continue to learn. Thanks, Matt! Thanks Samantha, glad to hear! Great read, another really good resource! Great article Matt. 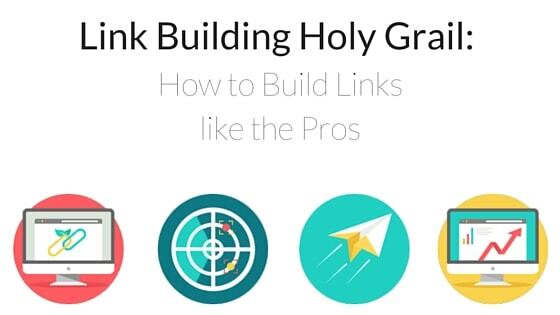 I’ve yet to see a link building guide so in-depth and graphically appealing as yours. On point and accurate, great read, well done. Hey Matt Banner, thanks for remind me about your message. In this article almost all the way to deepen the link building you have given. Maybe I can only give advice to you deepen techniques to speed up the ranking with the technique of “Aged Domain”. This is the key to increase the chances for success in every competition keywords. The other thing’s Link Building with simple techniques and without the use of software. Thanks for sharing this Matt. Nice work! Love that you shared case study of your own. Great post, very thorough and informative. One quick question. I’ve read a lot of stuff on outreach and while many posts touch on the email body, I’ve not read much on email subject. Do you have any experience with what works well in this regard? Half the battle is getting the email opened in the first place, and you certainly don’t want it to look spammy. Any wisdom to share on ‘cold call’ email subject lines? Wow, this is one of the longest infographics I have ever seen. With good content 🙂 Thx and good luck with the blog. Wow thanks for this! Such in depth knowledge. This is so helpful to me as a blogger and content marketer! Lots to think about and implement! Great article. I’ve tried broken link building but because it takes so long, we gave up. I know how important it is and have to get back to doing it.